Bringing a broader instrumental palette, more cinematic in scope than their debut, Lord Huron aims high and largely succeeds. In discussing Lord Huron, it’s impossible to ignore the tonal similarities of lead vocalist Ben Schneider’s voice to that of Phosphorescent’s Matthew Houck, Fleet Foxes' Robin Pecknold and My Morning Jacket’s Jim James. Each possesses a similar timbre that seems to exist almost solely within the genre, becoming a prerequisite of sorts for those looking to play this very specific form of washed out, sepia-toned Americana. While heavy reverb certainly plays a role in the sound, there’s a certain grain in the voice of each, an affectation that functions as a sort of evolutionary trait inherited by those fated to front folky indie rock bands. That having been said, with this, their second full length, Lord Huron succeed in meeting the requisite criteria of their most direct influences and have crafted an album sure to appeal to those enamored of the aforementioned groups. It’s a bold, declarative statement that finds the group brimming with deserved confidence and assurance. From the outset, everything about Strange Trails feels bigger and more fully realized than their debut. Where that album, Lonesome Dreams, possessed a somewhat muted element of sameness in both its gauzy production and balladic tempos, an approximation of the title itself, Strange Trails finds the band moving in a number of stylistic directions that, coupled with their fuller, more assured sound, lends a weightiness to the album that helps imbue it with greater resonance. 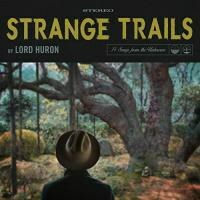 On “Way Out There” Schneider sings, “If you think that I’ve changed/You know me not.” And in truth, little has changed for Lord Huron from a thematic standpoint. Tales of heartache, loneliness and ennui permeate these 14 tracks, adhering to the playbook of American folk tropes. But what has changed, and for the better, is their arrangements. Having beefed up their production and fleshed out their instrumentation, Strange Trails is a more substantial album than its predecessor. Where Lonesome Dreams relied largely on sparse, acoustic-centric arrangements, Strange Trails incorporates a host of acoustic and electric instruments, all lovingly swathed in a shimmering sheen of reverb; it’s the sound of a band having formed out of what had essentially started as a solo project. From a narrative standpoint, the album functions as a Western, one that embodies the titular trails, a journey through wild lands in search of something (a better life, perhaps?) and finding all variety of trials and tribulations along the way. Characters spring to life, some quite literally (“Dead Man’s Hand”), wander aimlessly and rage in the face of impending death. It’s all rather tightly structured, necessitating several listens to fully sink in due in part to the sheer length and breadth of the material. But throughout, there’s a greater accessibility to these songs, a more concentrated effort at broader appeal through stylistic variance and more focus on melodic hooks. “Until the Night Turns” possesses one of the strongest of these and, with it’s up-tempo feel, is a welcome departure from the more somnambulant tempos that dominated much of Lonesome Dreams. Virtually begging for broader commercial appeal, the song is built on an insistent beat and propulsive melody that breaks into a lovely almost-half time bridge that builds to a resolution back into an up-tempo shuffle before ending on a triumphant note. By adding to their sonic palette, Lord Huron begins to break free from the shadow of Fleet Foxes, et. al. and become a band in its own right, one worth any and all attention they may receive as a result. Elsewhere they still rely a bit too heavily on familiarity to state their case. The chorus of “Louisa” bears a striking resemblance to “The Lion Sleeps Tonight”, while “Fool for Love” carries hints of both “I’m on Fire” and “Walk of Life” (not to mention their own “Time to Run”). By crafting songs built around snatches of existing melodies and established aesthetics, contemporary bands are better able to reach an existing audience quickly and easily, easing them into a familiar framework. But this essentially is a disservice to the listener as the band refuses to challenge, coming across as largely amenable and undeniably accessible. This approach, while largely successful, tends to lessen the overall impact an album might have, burdened by its derivative, uncomplicated nature.